The Bruins had the momentum back. Ryan Spooner had just buried a one timer on the 5 on 3 powerplay to tie the game at 3-3. The Bruins still had an additional minute-plus of 5 on 4 to add to the momentum. On a casual clear out by the Ottawa Senators, Zdeno Chara retrieved the puck behind the net and passed it off to Reilly Smith just behind him. Then in a baffling move, Reilly Smith tried to take the puck right in front of the net with Pageau tightly forechecking him. Reilly Smith predictably lost the puck to Erik Condra, who dished it off to Jean-Gabriel Pageau for a shorthanded goal. Fans didn’t see much of Reilly Smith after the brutal play and rightfully so. That was the last straw for Claude Julien and that was pretty much Smith’s night, as he logged a Bruins career low of 7:50 of TOI and an atrocious -3 rating. And so it continued. 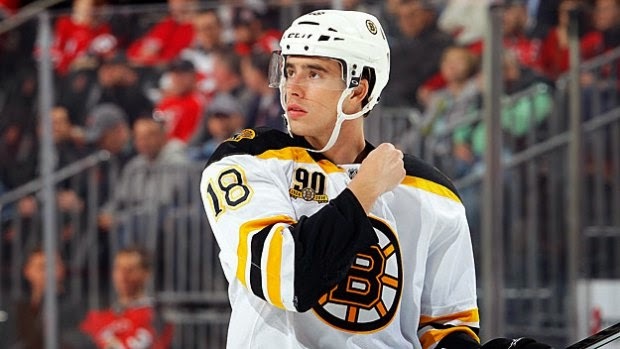 Reilly Smith has 1 point in his last 9 games, 0 points in his last 6 games. It wouldn’t be harsh to say that he’s been pretty much invisible in the last 9 games. Why is he not performing well? Maybe he’s hit a bad slump. Every player does. Or maybe, we can safely conclude that this is who he is – a streaky winger who will inevitably hit rough stretches every season. Reilly Smith had a worse stretch (believe it or not), toward the end of November into December. He had a 10 game stretch with 0 points, and a rating of -7. This isn’t exactly what you are looking for from your top 6 forward, no matter the circumstances. Let’s not forget Smith’s struggles down the stretch last year. He scored 2 goals in the last 29 games of the season. Even for a rookie, those were some atrocious numbers. In addition, his playoff performance was average at best, though he did score a couple of key goals. He certainly hasn’t responded to the pressure very well. Those 9 games mentioned earlier were the aftermath of his extension. To add to the pressure, the Bruins are in the middle of a playoff hunt, and they need any help they can get from a player. None of this should surprise the Bruins, however. They knew what they were getting into and who they were signing. This has been a 2 year trend for Reilly Smith. This is who he is. They were hoping he would find a way to be more consistent in the future when they signed him to the extension. Unsurprisingly, that’s exactly what they are stuck to do at this point. They just have to hope Smith can figure it out – and fast. And with injured players like Krejci and Connolly poised to return soon and looking over his shoulder, Smith better hope he finds his game - and fast. Until then, it’s just Reilly being Reilly. Read more from Andy Hwang by clicking here. Find him on Twitter on @andyhwang05 and follow @BruinsLife for all Bruins news and updates.